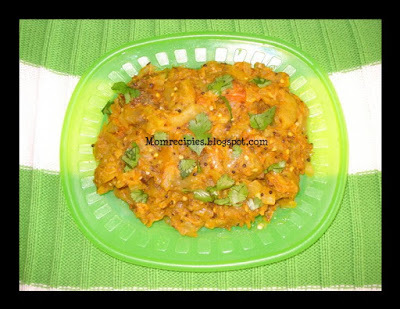 Baingan Bharta is mashed eggplant cooked with mild blend of spices .This is very flavorful and tasty dish. Traditionally bharta is made with charcoal roasted eggplant . This is a very popular dish usually served with rotis ,chapatis,naan. 1. Wash and wipe the eggplant.Cook the whole eggplant in microwave for 8 to 10 minutes until it is tender.OR Grease the eggplants and broil them in an oven until the skin browns and the inner flesh gets cooked. Be sure to first put the eggplant in an oven safe shallow bowl or a cookie sheet.OR Roast the eggplant over direct flame for few minutes,turning it often so that it cooks evenly.Roast till eggplant blackens,starts peeling off and shrinks. 2. Cool and peel off the skin then mash the eggplant and keep aside. 3. Blend the tomatoes, ginger and green chili. 4. Heat the oil in a pan and add cumin seeds.Allow it till cracks then add asafetida. 5. After cumin seeds splutter, add onions and cook till the onions turn tranlucent. 6. Then add tomato puree, coriander powder, turmeric, red chili powder, and salt and let it cook for a few minutes until tomato puree has started leaving the oil. 7. Add mashed eggplant and let it cook on medium heat keep stirring the eggplant and mashing the eggplant thoroughly as it cooks. 9. Add garam masala to the eggplant and mix it gently.Garnish with chopped coriander. 10. Baingan Bharta is ready serve hot with rotis, parathas, or naan. Enjoy! Looks so coroful and yummy. my favorite side dish! looks divine..